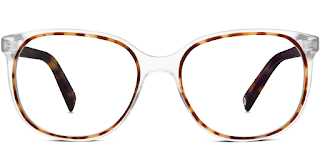 Warby Parker Concentric Collection | Chelsea B. One of the best things about wearing glasses, is that there are so many different styles of glasses out there. If you wanted to, you could wear a different pair each day of the week! I'm so excited to be sharing with you guys the new Concentric Collection from Warby Parker! 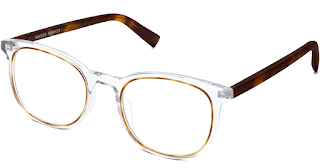 Warby Parker is one of my all time favorite places to purchase glasses from. When I saw the Concentric Collection, I just knew that I had to post about it to show you guys! The Concentric Collection features frames that have just an accent of color. This collection is great for those who really like the clear frames, with just a pop of color. Each ring of color around the frames, is perfect for eye colors. Brown for blue and purple for brown/green. The touch of color will really make your eyes pop! That can be a problem for glasses wearers, as they feel their eyes are hidden behind the frames. That won't be a problem with the Concentric Collection! The Concentric Collection features the Durand, Chelsea (how awesome is it that the glasses and I have the same name?! ), and the Laurel frames. Warby Parker frames are some of the most durable glasses that I've ever tried! They are amazing quality! Interested in the collection but aren't sure how they'll look on you? Warby Parker has this awesome service that allows you to choose up to five frames, to try before you buy. It's free shipping too! How awesome is that?! Shop this collection and more here!